In today’s Gospel (Matthew 17:1-9) we accompany Jesus as he takes three of the disciples, Peter, James and John up to a high mountain where his appearance dramatically changes before their eyes. They see him in a very different light. This is recorded in all three synoptic Gospels with minor differences in the story. In Luke Jesus is praying as his appearance changes and astonishes the disciples. (See also Mark 9:2-8 and Luke 9: 28-36). In the three Gospels this trip up the mountain occurs 6 to 8 days after he tells the disciples that he will die and be raised to life. He is headed toward Jerusalem and all that will unfold there. What also astonishes and frightens the disciples is the appearance of, or the vision of, Moses and Elijah talking with Jesus as they are enveloped in a bright cloud and Jesus is affirmed as he was on the day of his baptism. “My Own, my Beloved, on whom my favor rests. Listen to him!” They are terrified and fall forward on the ground. Jesus touches them and tells them to get up and not to be afraid. They then dare to look up and only Jesus is there with them. How are we to understand this powerful and apparently mysterious experience? And what is its connection to the first reading where (in Genesis 12:1-4) Abram and Sara are told by God to leave the land they have lived in for many years and go to a land that God has prepared for them? Abram is already 75 years old and probably is not up for a long trip South with his family and all he owns. And he and Sara are childless and so he is prepared to die without a legacy. But God promises that God will make a great nation from Abram and that all families of the earth will be blessed in Abram’s seed. Abram, who is the patriarch of faith, does not argue with God. They get up and go. When they arrived God repeated God’s promise that Abram’s offspring would have this land. Abram then went to the hills east of Bethel and pitched his tent and built an altar where he prayed. (Gen 12:8). We know the end of the story-that Abram and Sara (becoming Abraham and Sarah) do, after further trials, become the patriarch and matriarch of the Hebrew people and that Abram’s seed through both Isaac (the Hebrew people) and Ishmael (son of Hagar, the Muslim people) and through Jesus, also through Isaac and Ruth, Jesse and David) are in “number like the stars in the sky”. Through faith, Abram becomes the father of Judaism, Christianity and the Muslim religions. In the Gospel account, Matthew is connecting Jesus to the pillars of Judaism through its greatest prophets, Moses and Elijah. While Moses represents the authority of the Law and Elijah, the prophets, both represent great faith and loyalty to God in times of exile and great doubt about who God is and what God is like. The implication is that Jesus fulfills and surpasses the Law and the prophets. The “Listen to him!” (said also at Jesus’ Baptism) means God has given Jesus the authority and Jesus’ Way (teaching and actions in life, death and resurrection) is the new Way that God is reconciling God’s people to God’s self. Both Moses and Elijah were tormented and persecuted as they served God and God’s people. Both climb mountains to be in holy space where God speaks to them, directs and guides them. While Moses is given the commandments, the Law, on Mt. Sinai, his first mission is given to him on Mt. Horeb, called the Mountain of God, where God speaks through a burning bush and says “I have seen the misery of my people, I have heard their cries, and I want you to go tell Pharoah to let my people go!” (Exodus 3: 1-10). Elijah climbs Mt. Horeb to flee from King Ahab and his wicked wife Jezebel after Elijah shamed 850 prophets of the gods Baal and Asherah (who “eat at Jezebel’s table”) on Mt. Carmel as God acted with fire to show God’s strength. On Mt. Horeb Elijah hides in a cave and waits to hear from God. There is a powerful wind, (like a Hurricane) and an earthquake and a great consuming fire. But God is not speaking through any of these. Finally God spoke in a “still small voice” in a “gentle whisper” and Elijah was told what to do next. Jesus is on his way to Jerusalem and what lies ahead. He climbs the mountain (scholars think it was Mt. 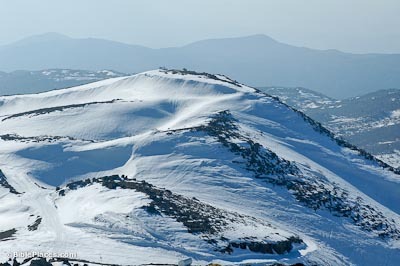 Hermon which is over 9,200 feet of snow- capped peaks) to be close to God and to pray. He takes those particular disciples with him “to be alone with them” according to Matthew, as they have reached a higher level of understanding. Nonetheless they fall asleep as he prays. They wake up to see Jesus “transfigured”- shining like the sun with his clothes as bright as a flash of lightening, according to Luke. Moses and Elijah appeared as well “in glorious splendor” as they discussed “his departure that had to take place in Jerusalem”. It is then that the whole group are enveloped in the bright cloud and the voice affirms Jesus as Chosen/Beloved who is to be heard. Jesus has to touch the disciples and tell them not to be afraid and they respond to his touch and see only Jesus there. We remember that the Hebrew and Aramaic languages convey meaning in metaphor and with much symbolism. Jesus, Elijah and Moses may well have climbed real mountains but we and they have many kinds of mountains to climb. Here the mountain is that place close to God, where we can speak to God and God can speak to us. The mountain is also high and represents a difficult journey of understanding. It is hard to do the climb and requires effort. It is a place to pray where enlightenment can happen, sometimes in dramatic ways. The cloud represents, and both indicates and sometimes hides the mysterious presence of God. The bright lights and fire and even the gentle voices where God speaks also represent our understanding and en-light-enment as we communicate with God who loves us and affirms us and guides and directs us. Sometimes literally as we climb a mountain the light is different so we can see in a new way. The air is also clean and clear and we can breathe easily and fully. The breath (Spirit) of God can fill us. We also have the perspective of the wider view, we can see all around from the mountain top. And, like Jesus and the disciples we have to come down from the mountain tops of very special experiences with God and faith, and enter the valleys and lower ground of everyday life. Christ accompanies us and we are emboldened by faith and grace to share what we have experienced and do what we have been asked to do, even when it takes all we have and the courage of Abram and Sara, Moses, Elijah and Jesus. Who is our God and what is our God like? For Abram and Sara, God provides. For Moses, God is a God who is moved by the suffering of God’s precious people and hears their cries. God sends someone to help. Moses is sent to lead God’s people out of terrible exile and oppression-to liberate God’s people. For Elijah, God comes through time after time. Elijah is ultimately not a laughing stock although 850 prophets of false gods stand ready to ridicule. God also cares deeply when Elijah is so depressed he tells God that he wants to die. God tells him to get up and eat as a good parent would and prepares water and food for him. Eventually God takes him right past the death experience unto life. We see God around and in Jesus. God is radiant, glorious, shining and ultimately affirming and loving. God gives the authority to be heard, the authority to lead, and the authority to change lives from misery to joy. God gave this to the prophets, and to Jesus, and to us as we climb the mountain and make the effort to communicate with God and to listen,hear and follow. Unlike Elijah, God’s Own, Beloved and Chosen is going to have to go through suffering and death to vanquish death and be raised from the dead. Right before this mountain top experience Jesus asks the disciples to deal with suffering and follow him. How beautiful it is that resurrection is on the other side of death. Let it be so for us, here and now and forever. In this Lenten season, may we have the faith of Abraham and Sarah, the prophets and Jesus. May we be disciples who have the strength to go where God sends us and to follow Jesus up the mountain. Whether the mountain is a bout with serious illness, family struggles, the loss of a loved one, daily dealing with our difference, rejection and exclusion, ministry and career challenges, difficult life transitions or environmental challenges, or just facing another day, may we know that God is there as we climb. May we see and experience the glorious God that Jesus, the prophets and the disciples knew. May we know deeply that we stand on holy ground and that we are holy ground. May we too be affirmed and experience ourselves as deeply loved by God as Jesus and Elijah were. May we have some friends to climb with. May we act to liberate God’s people with the faith and strength of Moses and may we face our “Jerusalems” as Jesus did filled with God’s Holy Spirit.